BASKING RIDGE, N.J. (CNS) -- Pat Shurmur, the head coach of the New York Giants and a lifelong Catholic, spoke about importance of faith during a Lenten gathering for a group of Catholic men in the Diocese of Metuchen March 30. "You got to live your life and you got to try to make the world a better place and I think that's what we're all charged to do," he said. Shurmur said that even when he's on the road, he tries to read and pray on a daily basis. "I have a little prayer card that I have laminated," Shurmur said. "The one thing about coaches, too, because we might get caught in the rain, is if you stand still long enough, they'll laminate you," he quipped. "When your feet hit the floor, just go live a good life, you can make a difference," he told them. "He's worked hard to be a dedicated disciple and friend of our Lord," Bishop Checchio said of Shurmur, adding that the coach's relationship with God "guides all the other areas of his life." "You know as you rise through the profession and you hit those high peaks and then you deal with adversity, a friend (like Bishop Checchio) is very, very important," Shurmur said. "Because we've supported each other in good times and bad, he's been a real inspiration and a constant reminder to me, my family and my friends, that we're all here to just make the world a better place -- to live a good life and do what we can for others." He said his relationship with his father shaped him in ways he can't even explain. "I really believe we're a combination of what we deeply believe and what we have experienced," Shurmur said. "Because of the way he helped me learn how to think and feel, and just the stuff he showed me, he helped shaped me in a way that there's no way to quantify," he said of his father. 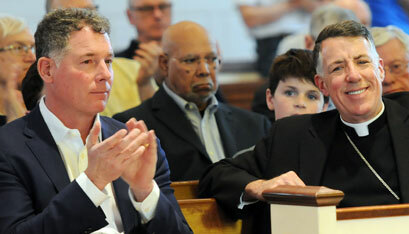 Shurmur couldn't remember a time when he missed Sunday Mass as a child. "My father would say, you think about it how you want, it's the end of the week or the beginning of the new week, but we're spending an hour together." He said his father taught him to live a life of compassion and to help those who can't help themselves. "I believe that everyone in here can be an effective leader, but it starts by being a good follower," Shurmur told the group. "And, really, to lead you don't have to be anything extraordinary, you just have to live a life of character and courage."